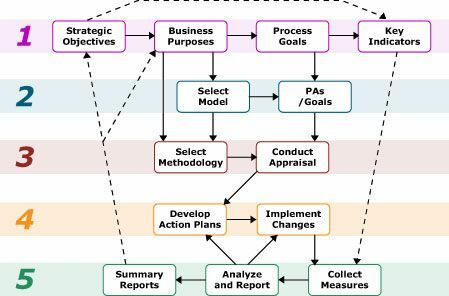 The PDPI℠ framework guides the development of a process improvement program, based on an analysis of the organization’s strategic objectives and its immediate problems. The framework helps organizations deal with five key issues of organization improvement and maturation. What critical business issues drive process improvement? Process goals and key indicators are derived from organizational strategic objectives and business purposes. Their priority may be modified based on immediate problems facing the organization. The purpose of the CMMI® modelsis to help your organization build capability to achieve performance excellence. The models provide guidance for improving the organization's processes for managing the development, acquisition, maintenance, and delivery of products and services. How can you quickly and effectively identify improvement opportunities? A process improvement effort will be most successful if it is treated as an on-going project to achieve performance excellence and improve your overall business capability. Successful process improvement requires a set of measures to determine the impact of the implemented changes. The measures are compared against a baseline in order to determine quantitatively how successful the process improvement is.